Safe, stable and efficient payment systems are critical to the effective functioning of the financial system. Payment systems are the means by which funds are transferred, primarily among banks. It is the main channel that financial shocks are transmitted across domestic and international financial systems and markets. Therefore, a robust payment system is the key infrastructure required to maintain and promote financial stability. The payments system is the collective term for all the individual payment systems in a country and has a strong influence on the velocity of financial flows in the economy, the overall costs and liquidity. It is also a channel for monetary policy transmission. The Bank of Papua New Guinea is committed in ensuring that it is safe and functioning efficiently. The Central Banking Act 2000, states that one of the primary objectives of the Bank is to “promote an efficient national and international payments system”. This is strengthened further by the National Payments System (NPS) Act 2013 which provides the legal foundation to implement new payment types, such as electronic cheque truncation that came into operation in September 2014 and direct credits in 2015. The Bank of Papua New Guinea introduced the Kina Automated Transfer System (KATS) over the last three years with the objective of fostering an efficient payment system for processing and settling all payments (both small and large value) between all the banks and their customers. This included electronic payments which are safe, efficient, fast and predictable. The operation and usage of KATS are defined in the KATS System Rules. All the banks (including BPNG in its dual role as a bank and as the operator of KATS) agree to abide by the System Rules. 2. Types of Payment Instruments in KATS There are three (3) types of payment instruments currently handled by KATS. Real Time Gross Settlement (RTGS). These are mainly high-value and high-priority interbank or individual payment instructions that must be settled by debiting and crediting the accounts of the banks involved immediately (in real time) and individually (gross) with finality and irrevocability (i.e. they cannot be disputed or reversed). It is a requirement of the KATS System Rules that every RTGS payment in favour of a customer of a bank must be credited to that customer’s account at the receiving bank within no more than two (2) hours of being settled in KATS. RTGS went live on 14th October 2013. Electronic Cheque Exchange (Cheque Truncation). This is a process whereby cheques are scanned at the bank where they are deposited, and the images of the scanned cheques, together with the accompanying details, are exchanged between the banks electronically, via KATS. Currently, banks have a four days period during which they can dishonor cheques. This period will be progressively reduced over the next one to two years as banks become more comfortable with KATS and the way it operates. Direct Credits (DC’s). This is the process whereby an individual or company can request their bank to make a payment to the account of another individual or company at any bank. Direct Credits are settled twice daily within KATS. Depending on the time of day when a Direct Credit payment is processed by KATS, the funds are available to the recipient’s account on the same or next day, if all account details are correct. Within BPNG, the Payment Systems Unit (PSU) is the operator of KATS and is responsible for opening and closing the KATS business day, monitoring the banks’ reserve funds, monitoring transactions between banks during the KATS operating hours, funding the Exchange Settlement Account (ESA) requirements and responding to queries from all the commercial banks. PSU is also responsible for producing payment statistics processed in KATS. In PNG, there is one single system which processes interbank transactions which is operated and overseen by the Bank of PNG. It is a so-called hybrid system, which accepts both “low value” (cheques & DC’s) and “high value/priority” (RTGS) payments. Due to different stages of KATS implementation, PSU began to compile statistics in January 2015. Note: In October, there was a significant increase in RTGS payments mainly attributed to interbank lending/borrowing between Banks. ¹The January – September data were from Maybank PNG Ltd. It was purchased by Kina Bank Ltd and the data, commencing from October 2015 were from the Kina Bank Ltd. Chart. 2: Values & Volumes by Cheque Payments Chart. Chart 5 shows two trends. 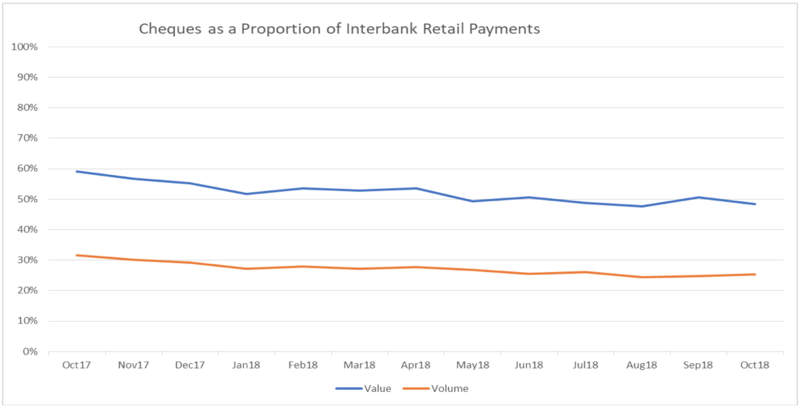 It shows that the volume of cheque and the total value of cheques, as a percentage of total retail payments, are both declining. Cheques are being replaced by electronic means of payment, as expected.